"This pie is easy to make and requires no cooking and is so yummy! A Christmas favorite of my family and friends. This recipe contains raw eggs. We recommend that pregnant women, young children, the elderly and the infirm do not consume raw eggs." In a medium bowl, cream together the margarine, eggs and confectioners' sugar; beat for 15 minutes. Spread evenly in the graham cracker crusts. In each crust, place banana slices on top of sugar mixture; spread pineapple on bananas. Spoon a little of the reserved juice over fruit. 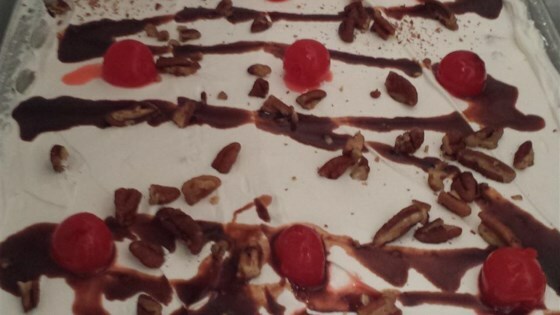 Spoon whipped topping over fruit; garnish with cherries and pecans. Chill before serving. this pie was freakin awesome. I have been making this for yrs. But put pineapple and strawberries also I refrigerate the pan with gramham cracker crust for about a hr. It makes speading the mixure on top easrier.